Nixon reissues a decade old watch design that was inspired by analog answering machines. Hardly anyone younger than twenty years old will likely remember ever having to use an answering machine (believe it or not, they still manufacture and sell the devices). But even so, Nixon’s reissue of their decade old Dork Too digital wristwatch design taps a nostalgic note, harkening back to an era when micro-cassette tapes were required for recording voicemail and “texting” was an alphanumeric pager skillset. The old school bulky answering machine aesthetic of the new Dork Too is paired with a small red or white digital display, alongside a large perforated speaker face that will playback a selection of themed kitschy sounds or voice announcement of the time, each sound recorded to complement the throwback vibe. In comparison to the original, Nixon reduced the size and placement of the display and increased the speaker to 168 perforation for a sleeker redesign. The reissue does offer one new school feature: its rechargeable via USB. 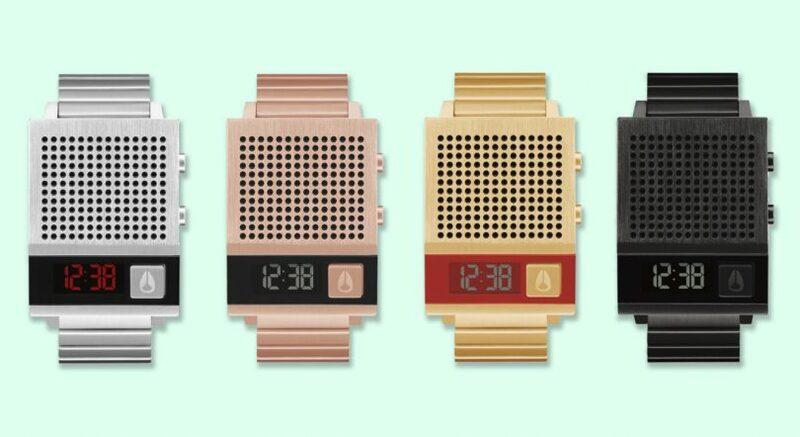 The Nixon Dork Too will become available beginning on February 5, with black, gold, silver and rose gold options (pricing: TBD).